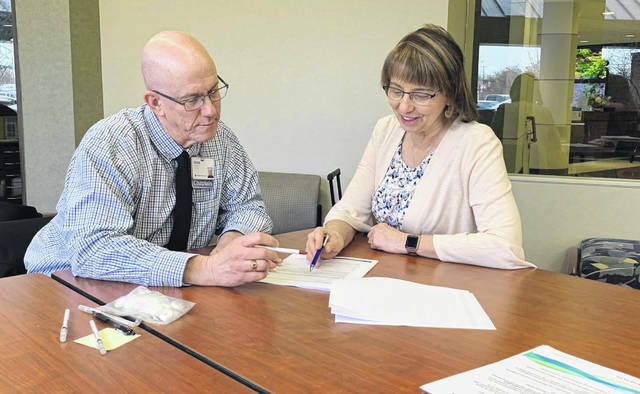 Herbert Wilker, Hospice/Homecare Chaplain, left, and Deb Warniment, Patient Advocate, right, go over a packet of advance directives forms at Mercy Health-St. Rita’s Medical Center as part of the National Healthcare Decisions Day event Tuesday. LIMA — Mercy Heath-St. Rita’s Medical Center opened its doors to seniors and their families Tuesday for National Healthcare Decisions Day to help with education and advance care planning. Advanced directive forms, including healthcare power of attorney, living will and do-not-resuscitate, were available on-site, as were employees to answer general questions. Herbert Wilker, Hospice/Homecare Chaplain and Bereavement Coordinator at St. Rita’s, said the hospital wanted to hold an open house so community members could have this access now, rather than later. There was a similar session at Old Barn Out Back Restaurant, where Community Resources of Northwest Ohio, Truster Senior Services of Northwest Ohio and Advocacy Professionals offered similar information. David Painter, of the Ohio Department of Insurance, spoke about how to assist people on Medicare and the different parts of Medicare, including Part D and Medicare Advantage Plans. They also heard from Dave Embaugh, a regional sales manager to Medicare I, and Georgiana Saffle, the founder of Advocacy Professionals. Not many turned out for the open house at St. Rita’s, but Wilker stressed the hospital will always have resources available any time at the information desk or at spiritual care. Wilker said those who did utilize the open house were mostly seniors looking to complete their documents or update them. However, there were some middle-aged adults who trickled in for themselves or their family members. St. Rita’s will be hosting additional community events for those interested in learning more or completing advance directives documents.